Orthopedic Center for Sports Medicine (OCSM) is a center of excellence dedicated to providing the highest quality care for patients and athletes with musculoskeletal injuries and disease. Drs. 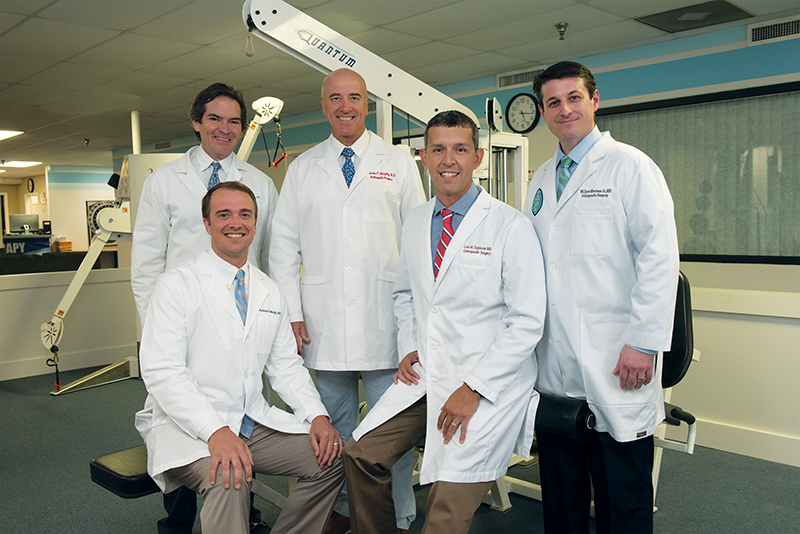 Murphy, Lyons, Espinoza, and Sherman are fellowship-trained and board certified orthopedic surgeons. OCSM is pleased to introduce Chadwick Murphy, MD, a fellowship-trained and board certified pain medicine/interventional spine specialist. OCSM utilizes physical therapists at both locations to facilitate recovery following injury or surgery. The practice encompasses sports medicine, arthroscopy, joint replacement, fracture care, spinal injections, workers’ compensation injuries, and legal cases with focused expertise in surgery of the shoulder, knee, and hip. An in-house MRI unit is an added patient convenience. OCSM is proud to provide orthopedic services as team physicians to the New Orleans Baby Cakes, triple-A affiliate of the Miami Marlins. OCSM physicians are pleased to provide care at Omega Hospital, the premier surgical hospital in our region.